Powers/Abilities: As with any Kree, Hez-Tarr possessed enhanced human physical abilities, including strength and durability, at least in his younger days. He was a disciplined and experienced military commander. (The Untold Legend of Captain Marvel#1) - Colonel Hez-Tarr, familiar with Mar-Vell's outstanding and decorated battle record, severely admonished Mar-Vell for failing in his mission to retrieve a valuable intelligence matrix from the Kree planet Tarsis, which was about to be consumed by Galactus. 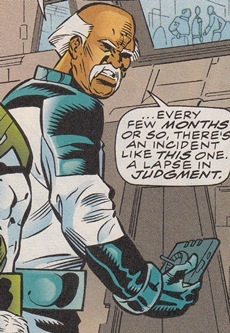 Hez-Tarr criticized Mar-Vell's decision to save Lieutenant Ran-Deff instead of capturing the data matrix as it fell into the turbulent, dying planet. Hez-Tarr declared that if it was up to him, he would strip Mar-Vell of rank and imprison him, but Hez-Tarr was concerned that would be his own fate in the judgment of the Supreme Intelligence. Hez-Tarr dismissed Mar-Vell after handing him new orders from Central Command. Comments: Created by Tom Brevoort & Mike Kanterovich (writers), Scott Kolins (pencils) and John Lowe (inks). Lieutenant Ran-Deff helped shift the intelligence matrix on board the same spacecraft as Mar-Vell; this matrix carried valuable telemetry data of Galactus' attack on the Kree world Tarsis. Ran-Deff, Mar-Vell and several Kree privates then lifted off in the spacecraft. He had trouble pulling down the safety harness when a collision caused both him and the data matrix to fall out of the spacecraft. Mar-Vell chose to rescue Ran-Deff rather than the matrix and told him that he was on report. Later, Hez-Tarr was very critical of Mar-Vell's decision to save Ran-Deff over the matrix. 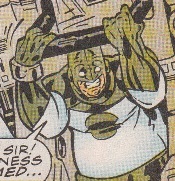 The expressions on the Kree privates around him indicated that he was not popular with them.